Evolution textbooks have long taught that fossil evidence shows grasses evolved around 55 million years ago, after the extinction of the dinosaurs (around 65 million years ago). Woe betide any illustrator who drew dinosaurs and grass in the same picture! But new evidence leaves the evolution textbooks with a dramatic grassy ‘time-travel’ conundrum. Researchers have discovered fossilized dinosaur droppings that contain the remains of at least five types of grasses.1 This means that not only did grass already exist at the same time as dinosaurs, but (at least some) dinosaurs also ate it.2 But how could they have eaten something that supposedly hadn’t even evolved yet? As one of the researchers commented, the discovery of grass phytoliths (silica bodies found in plants) in dinosaur coprolites (fossil dung) ‘was a complete shock’.3,4 So the new evidence will force a dramatic revision of evolutionary theory about the origin of grasses. There is no ‘time-travel’ problem when you start from the Bible. 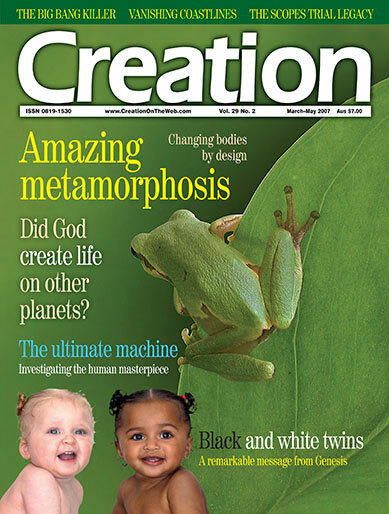 It’s the Bible, not the ‘fossil record’, which tells us the order of appearance of organisms on this planet. Thus the grasses were created on Day 3 of Creation Week, so they actually preceded the dinosaurs, which were created along with the other land animals and man on Day 6. So it’s quite okay for illustrators to depict grass, man,5 dinosaurs and other animals and plants as co-existing on this planet at the same time. There is no ‘time-travel’ problem when you start from the Bible. And dinosaurs are not ‘prehistoric’ since they lived after the beginning of written history, which starts, by the way, at the very beginning of time itself (Gen. 1:1). Photo by Linda Lou Haywood, <rocksandminerals.com>. The fact that we find fossilized dinosaur dung at all speaks of rapid burial in an oxygen-free environment—for how else could dung have been so preserved? And such coprolites have been found right around the world—this is consistent with a global Flood of cataclysmic proportions (Genesis 6–9). So, from the Bible, there is no ‘dilemma’. Prasad, V., Strömberg, C., Alimohammadian, H., and Sahni, A., Dinosaur coprolites and the early evolution of grasses and grazers, Science 310(5751):1177–1180, 18 November 2005. Return to text. Piperno, D., and Sues, H.-D., Dinosaurs dined on grass, Science 310(5751):1126–1128, 18 November 2005; perspective on ref. 1. Return to text. Hecht, J., Dino droppings reveal prehistoric taste for grass, New Scientist 188(2527):7, 2005. Return to text. 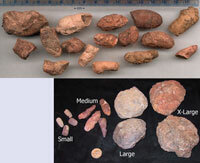 According to the researchers, the spherical coprolites (fossilized feces/dung), which measured up to 10 cm across, were probably deposited by titanosaurs, the most common type of dinosaur represented in the rock layer holding the coprolites. 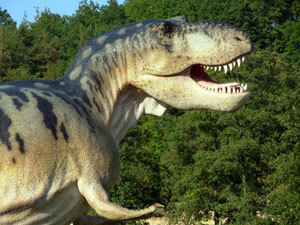 Perkins, S., Ancient grazers: find adds grass to dinosaur menu, Science News Online, 2 May 2005. Return to text. Evolutionary teaching has led many people (even many Christians) into accepting the existence of an evolutionarily primitive ‘Stone Age’ ‘cave-man’ stereotype who (which?) preceded the ‘evolution’ of agriculture, metalworking, etc. But the Bible makes it clear that man from the very first tended fruit trees (Genesis 2:15), grew field crops (Genesis 3:17, 4:2–3), and forged metal tools (Genesis 4:22). The Bible also relates that later there were indeed people (not evolution’s ‘cave-men’) who occupied caves, e.g. Lot and his daughters (Genesis 19:30), the kings of Joshua’s day (Joshua 10:16, 22–23), Samson (Judges 15:7–8), David (1 Samuel 22:1), and Elijah (1 Kings 19:9). Return to text.